Montreal: Linda Leith Publishing, 2012. Migration stories, says Abou Farman, are often told through the personal struggles and travails of the migrant, “the great voyager figure of our most recent centuries, the harbinger of hybridity, the metaphor for risk, sacrifice, toil, abuse, inhumanity. And humanity.” These are the stories (both horrific and redemptive) that we hear about in the news, in taxis and airports, in bars and corner coffee shops. They are both real and existential, shared, denied, argued about, internalized. Seldom are the threads of such narratives woven together and imbued with the originality of insight brought to the page by Farman. A meditation on movement, conveyed with humour and a subtle irony. 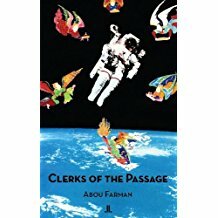 Clerks of the Passage takes us on a journey in the company of some strange and great migrants, from the 3.5 million year-old bipedal hominids of Laetoli, Tanzania, to an Iranian refugee who spent seventeen years in the transit lounge at Charles de Gaulle airport, from Xerxes to Milton to Revelations, from Columbus to Don Quixote to Godot.